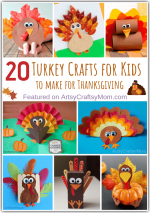 Little ones will be gobbling for joy when they make these turkeys! Fun to hang on walls and doors, these goofy birds make great decorations for your Classroom celebrations and Thanksgiving dinners table. Cut the paper plate in half. I tried cutting it in unequal parts but it works better cut through the middle. Lets get the face of the Turkey ready first. Cut out a small circle from brown construction paper. Cut out the feet, the beak & the red wattle. Using glue, paste all them together. Cut and separate the layers. Now Foldeach semi circle into half, another half & again till you just have a small pie shaped piece. Cut the edge into a rounded shape. Make sure each progressive shape is smaller than the one before it. So Red semicircle is the largest then the others arranged dark to light. Cut out a semicircle about an inch bigger than the paper plate from brown paper. Fold and cut the brown paper just like we did with the tissue paper. Stick them onto the paper plate using sticky glue. First Brown, Then Red, then Dark Orange, Then light orange and then Yellow. Doesn’t that look amazing already?? Stick the face of the turkey onto the paper feather paper plate . and Voila! 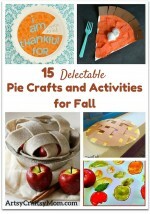 your very own Paper Plate Thanksgiving Turkey craft with Tissue Paper is ready! 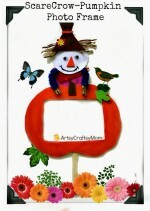 This post is a part of the Crafty ladies Monthly Craft Challenge and I am the host this month. 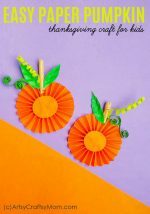 Here are some more tissue paper Ideas by my fellow Crafty Stars! You can also keep up with our latest crafts by following our group Pinterest Board or following our hashtag #kidscraftstars on Instagram. 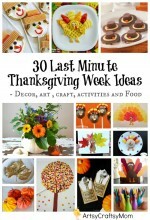 Here’s our very popular post from last year on Thanksgiving .. Click on image to check out the post.